Michel Faber made me do it. Such is the power of blurbs. 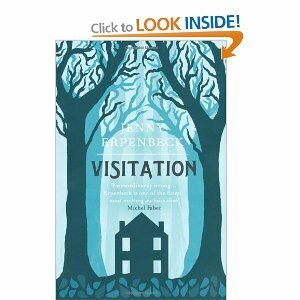 The cover of Jenny Erpenbeck’s “Visitation” says, courtesy of Mr. Faber: “Extraordinarily strong… Erpenbeck is one of the finest, most exciting authors alive.” He stops just short of an exclamation mark. So far, so blurby. But it wasn’t the blurb that caught my attention, it was his spiky review in the Guardian. His opening made me sit up: “At its worst, the British literary scene behaves like a community of nerdy parochialists who imagine themselves to be cosmopolitans, fretting about whether there can be any great novels any more now that Amis is past it and Updike has died. The ongoing story of literature in foreign languages is barely noticed, a background pixel in the all-important anglophone display.” He derides the appearance of a book that can only be Freedom, and wonders why the British “struggle” to understand, say, middle class American nuance, but seem to be disinterested in any works in translation – and particularly German ones. As someone actively looking for German work in translation, I was grateful to Faber for pointing the book out to me. As I had never seen it in a bookshop – and have yet to see it – I ordered in on line and was delighted that, when it arrived, slim in its cardboard sleeve, it was only 150 pages. I do like a short book, especially when it is tackling 24,000 years of history on one piece of land. (This, in and of itself is not remarkable. James Michner made it his speciality, and if there is a better history of one place from prehistory to the present than Centennial, I would take some convincing.) But Centennial is a big book. A proper door stop. At page 150 in Michener’s, you might still be wandering around with dinosaurs. The rest of this blog could go on to be a standard review of Erpenbeck’s book, which I thoroughly enjoyed. I would tell you that I admired the device of the Gardener character who links the chapters that move through the history of a house, from inhabitant to inhabitant. He never speaks. We watch the land change through his eyes; we see the circumstances of the house change through his chores, which mark his eventual decline. I would tell you that Erpenbeck is able to create fully realised characters in what might look to be quick sketches, but are actually careful and specific wood cuts, deep and dark. But I’m no fiction critic. I am a wholly selfish reader, looking only for what I want. It limits my reading to be sure, at least the pleasure of reading, reading as I am through that filter or, perhaps, those cross hairs. I am looking for German writers to tell me what I do not know about how it is to be German. Nothing more. Nothing less. It is a great expectation. Do I really expect a writer to deal with the whole of their cultural history in any one book? Sadly, for me, yes. For me, a really good book is not only a window on a world but a lift shaft, going down. I want to understand how the world of the book is affected by the history of the people and the place, and also to see how the world of the book will affect the future, whenever that is. I do not want a book that is relentlessly “present”. And I mean not only the back stories of characters and their parents, grandparents, but also their ancestors, their ghosts, their culture’s failures and race’s migrations. I want to know how the uses of land have changed. I want to know where the graves are. The problem for me – you will have seen this one coming – is that I’m American. I have no German ancestors. Not a one. My second book is a history that is not “mine”, and it makes me afraid, just a little, to write it. Of course, I have written it. I have a finished first draft. I will begin the second draft on Monday. And I will begin my rewrite without reading the first draft. I don’t need to. I already know what I wrote and that it is not “right”. I have written a draft of what happens in the book, as if it is the story I would tell you in a pub. It is all plot and story and characters doing what it is that they do and, sometimes, why. What I don’t have is a history for them or their worlds that is deep enough, rich enough, to satisfy. What I know and have written is “correct” but I know it is not – right, not enough. I know who it is to be those characters, living in those moments. But I don’t have the weight of their histories in me. A marvellous exemplar of this kind of work is Louise Erdrich. No doubt, she deserves a blog of her own. That will be for next time. Suffice to say, I still have books of war that I am ploughing through. I am still making sure my history is “correct”. But I am also looking for – something else. Something richer, deeper, darker. Something I don’t yet know. Erpenbeck got me some of the way there. But I’m greedy. It wasn’t far enough.